Gone are the days when our unknown scribbles remained only to us, because we thought they meant nothing. Doodle â€˜isâ€™ the â€˜inâ€™ thing these days!! A believe me when I say it, advertising and graphic arts agencies are ready to promote any off beat doodle work. Welcome back to my new post! Gone are the days when our unknown scribbles remained only to us, because we thought they meant nothing. Doodle â€˜isâ€™ the â€˜inâ€™ thing these days!! A believe me when I say it, advertising and graphic arts agencies are ready to promote any off beat doodle work. Tattoo artists and illustrators are also a lot into using doodles nowadays. I am sure you have seen a lot of doodles in and around social media pages as well. Since black and white pen works are already something you may have seen, I am here today to show you another kind of doodle. I call it â€œLazy doodleâ€. The reason behind me naming it, is the fact that, itâ€™s a kind of doodle you start making with a black/a mono colored pen, but then you become too lazy to continue with that, hence you switch medium. Doodles are generally like the ways a mind thinks things. The subject may be anything. 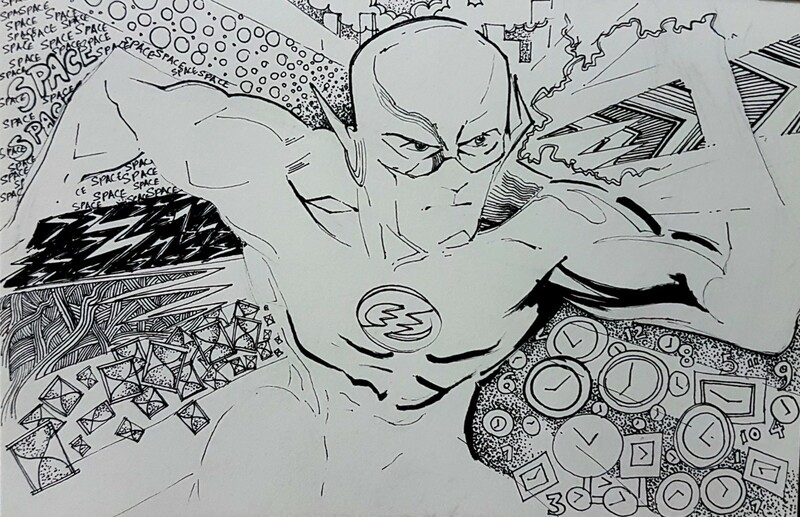 Well I am a comic book and animation fan, hence I could not resist starting off with â€œThe Flashâ€ from DC comics. When you have an idea ready, pen it down. Mind that you need only the lines you want to stay. A doodle need not necessarily be detailed. It may very well be a depiction of the ideas you think. Once you have penned down your idea, may be something like the below comes up, itâ€™s time for Step 2. You have already seen at step 1 that the doodle effect has already started off. However, what I would like to suggest is, donâ€™t stop there. Go ahead, free your mind, and doodle. 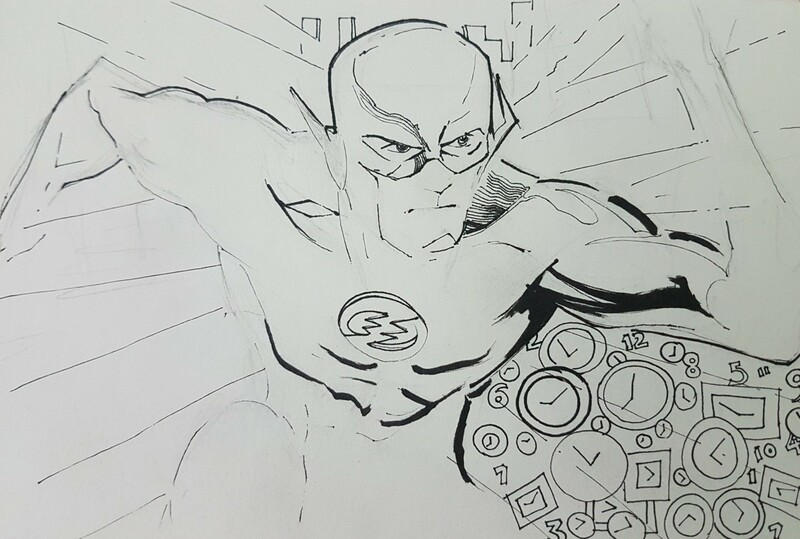 Since Flash is all about that space and time thing, hence I doodled with space and time only. So here we are almost at the end of step 2. Yes it is the easiest step of all. Get lazy and drop your pen down. 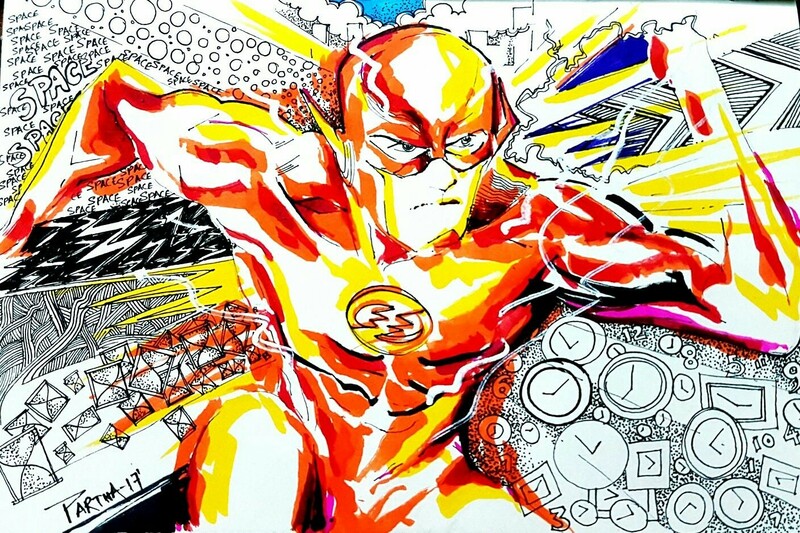 Pick up the color pens.Lets bring Flash to life with the colors of Flash!! A dash of Orange, a bit of Red, a bit of yellow shall do the magic. At the near end you shall definitely smile and tell yourself that you need to be lazy more often!! Here we are at the middle of step 3. Those last finishing touches shall do just great for the picture. Take a look below. Here is Flash. THE FLASH!! At the end of Step 4: Voila!! 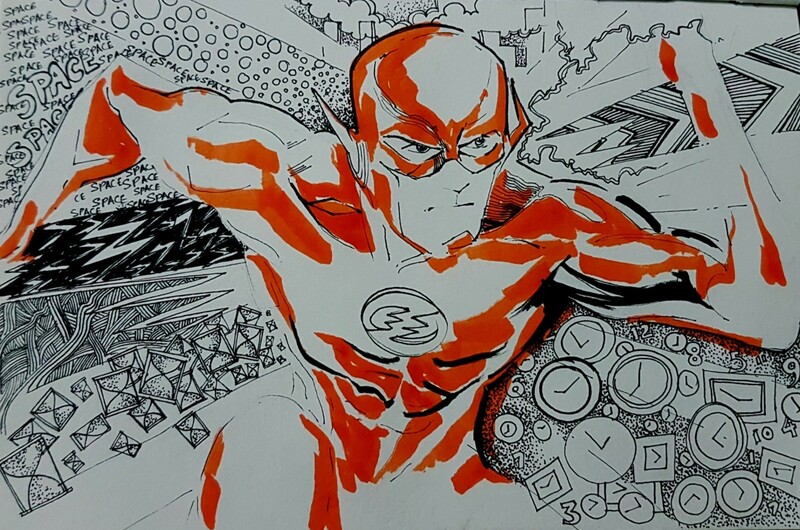 With this hint of DC comics, I hope this doodling helps you bring in more and more enthusiasm to go on with this passion for art, and doodling. I shall be back with more exciting artwork blogs. Until then, take care!! Keep a watch on my facebook page for more such artworks! !